As of September 30, Facebook Graph Searchnow allows users to search old Facebook posts, up to and including posts from the site’s original launch in 2004. The search is not specific to any single Facebook account; search for the words “posts about Breaking Bad,” and you’ll get thousands of Facebook users’ thoughts on the series and its explosive finale. The primary concern about this new social media development is, of course, privacy. Facebook Graph Search does not limit itself to search results from your friends and connections. Instead, it allows you to search any Facebook post that appears under a public setting. Unless you specifically configure your Facebook privacy settings, your posts, images, locations and statuses are all available to be read by anyone that uses Facebook Graph Search. The other concern about this development has to do with Facebook’s original status as a private network. When Facebook launched in 2004, it was only available to Harvard students. It quickly expanded to include other colleges and universities as well as high schools, but only became fully available to the public in 2006. This means that for at least the initial two years of Facebook’s service, users were under the impression that they were posting to a private network. They were not yet aware that Facebook statuses would someday be searchable by parents, employers, and legal officials; at that time, the only people who were eligible to view Facebook statuses were other students. Yes, the common assumption in 2013 is “never post anything online that you wouldn’t want the world to see,” but in 2005, users were correct in assuming that they were using a private, restricted website. 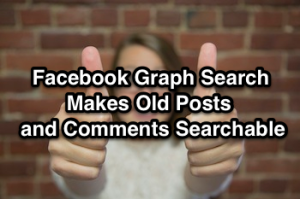 It is relatively easy to keep your posts out of Facebook Graph Search, although it is much more difficult to remove comments you made on other people’s posts. At this point, the only way to keep comments out of Graph Search is to individually delete each comment. This is another subtle breach of loyalty by the social media giant: users did not spend years commenting on friends’ posts with the idea that one day all of these remarks would be searchable. Who stands to benefit from Facebook Graph Search? In addition to the social media giant itself, Graph Search is an excellent tool for businesses looking to identify target markets, as well as determine how users are talking about their companies and products online. Companies such as 29prime, which focus on building businesses’ visibility on the internet, could very well have to take a look at how Facebook Graph Search results play into overall SERPs across the web. Expect businesses to also learn how to optimize Facebook Graph Search, and help their individual products or services rise in related search results. In our “posts about Breaking Bad” example: imagine if five of the top 10 Facebook Breaking Bad search results included a comment about eating Ben & Jerry’s Americone Dream ice cream. Businesses will quickly learn that the more people talk about them on Facebook, the better rankings they’ll receive, and are likely to invite Facebook users to participate in promotions and raffle-style contests in exchange for product mentions and positive comments. Some unscrupulous businesses may even create fake Facebook users to raise the profile – and search ranking – of their products. As with all Facebook updates, users will no doubt fight back by continuing to restrict their privacy settings and becoming more careful about what they post online. For the rest of us, Facebook Graph Search may prove to be an interesting tool with several practical business uses. Only the timelines will tell.